Incongruity: The state of being incongruous or out of keeping. It is a word that springs to mind when, while carefully sorting through a box of art deco sconce parts and cheap Czechoslovakian tourist pottery in the basement of a sweet old lady in Ballard, you happen, at the bottom of the box, upon what at first glance is a rolled up ladies manicure kit from the 40’s. It is heavier than expected and thicker than it ought to be. 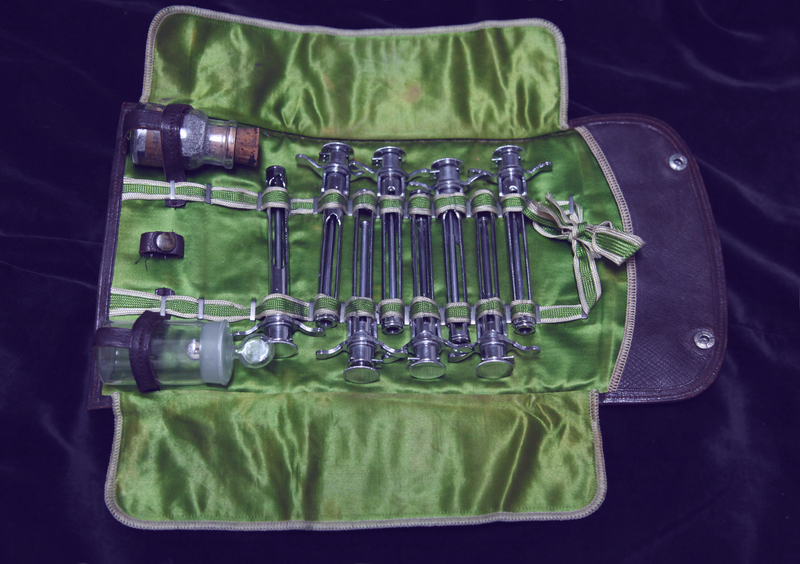 You undo the snaps, unroll it and are confounded by a lack of manicure tools and instead find a 1950’s era Tubex syringe in each of the little tool holsters. They are the kind used in WWII and Korea for field administration of morphine. Eight of them in total. Arranged as though for display. All empty of their cartridges. You think to ask the sweet old lady upstairs but decide to let the incongruity stand as it is: A tantalizing mystery.